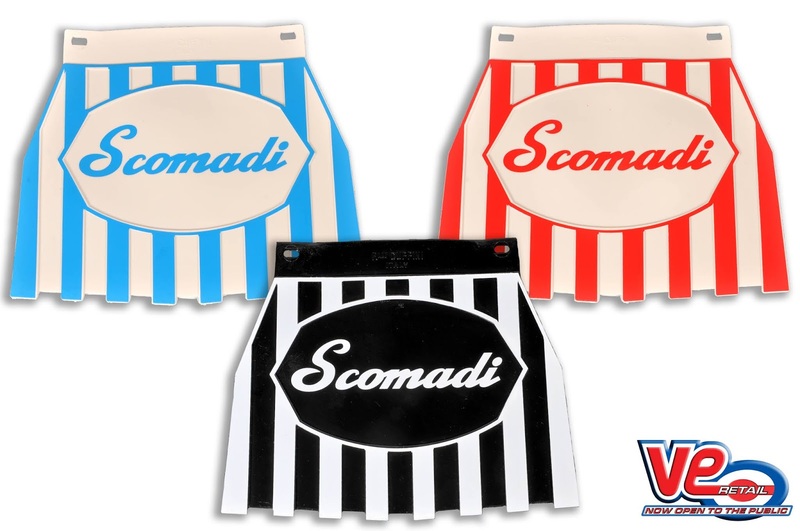 Scomadi owners will love the new mudflaps from VE (UK) featuring the brand name in a script font. Manufactured in Italy from high quality rubber, these mudflaps will help reduce spray from your wheels whilst looking stylish at the same time. Fitting the mudflaps is easy, requiring just 2 fittings to secure to the rear of the scooter. Available in black/white, blue/white, and red/white. chequered, Italian flag, Lambretta logo, “L” plate, Mod target, Union Jack, and Vespa logo. This entry was posted in General Parts and tagged Mudflaps, scomadi. Bookmark this page.